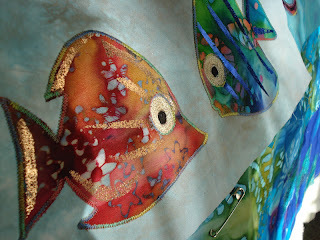 Sometimes it's nice to sew without having to think too much and string blocks fit the bill exactly. I decided to make a colourful throw using the string blocks as the center piece. I cut up all my batik scraps to make the blocks however, I wanted something to break up the strings. 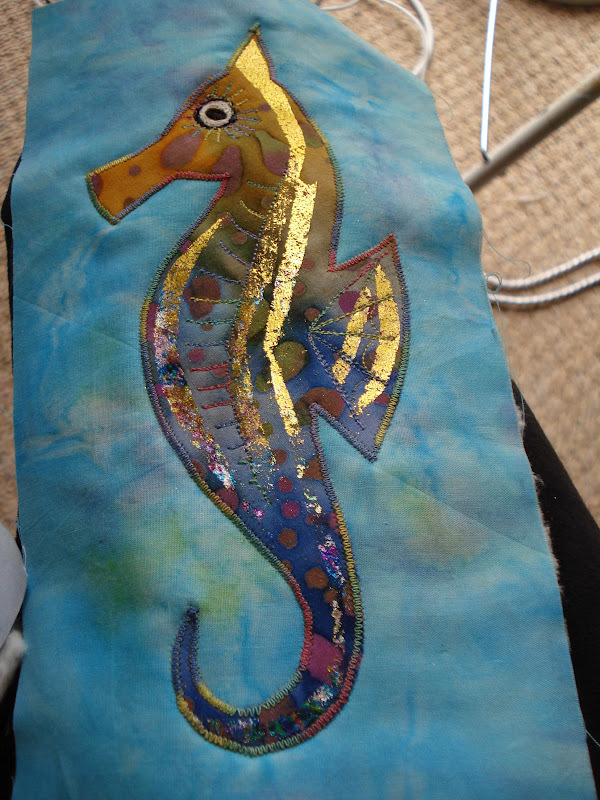 I decided on a few fishies and a couple of seahorses. I machine appliqued the shapes then set about pimping them up a bit! 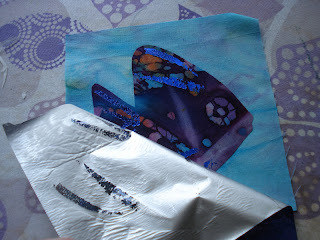 This is what I used next - transfer foils which I got at the last quilt show. 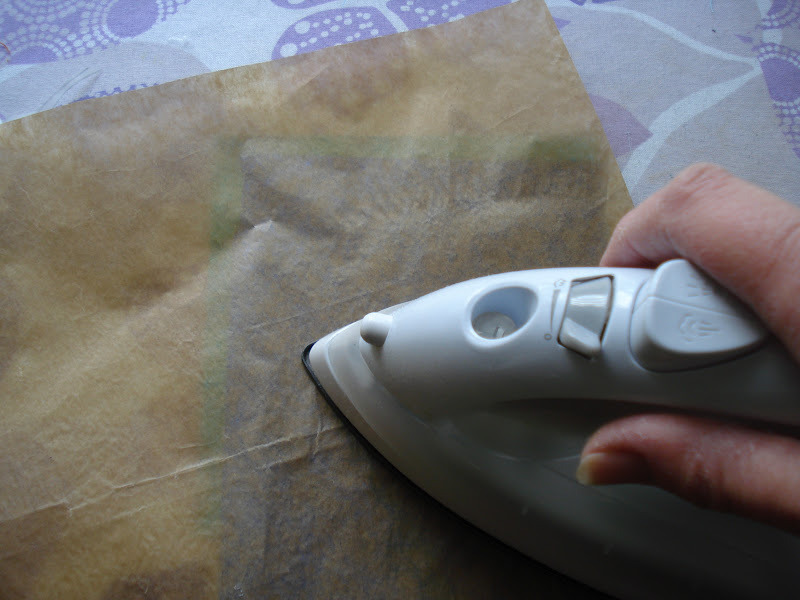 I'd never used these before but they were easy to use and I loved the effect. 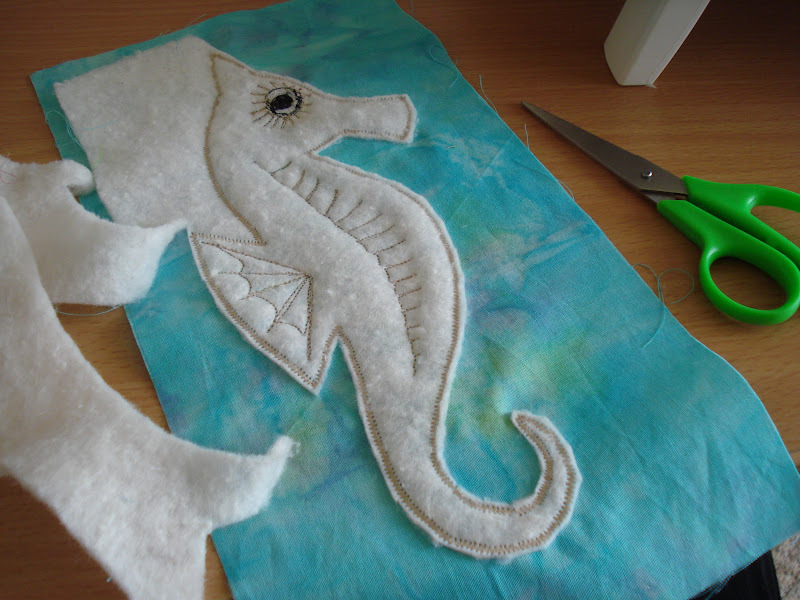 I cut out slithers of bondaweb and ironed them onto the design. Simply peel the paper off the bondaweb and lay the foil (shiney side up ) over the area to be jazzed up. Cover with a piece of baking parchment and press with a hot iron. 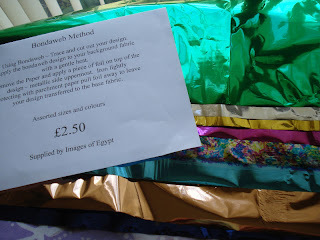 When you pull the foil back, some of it will be transfered onto your design. Before I appliqued the fish/seahorses, I added a layer of wadding to the back first. 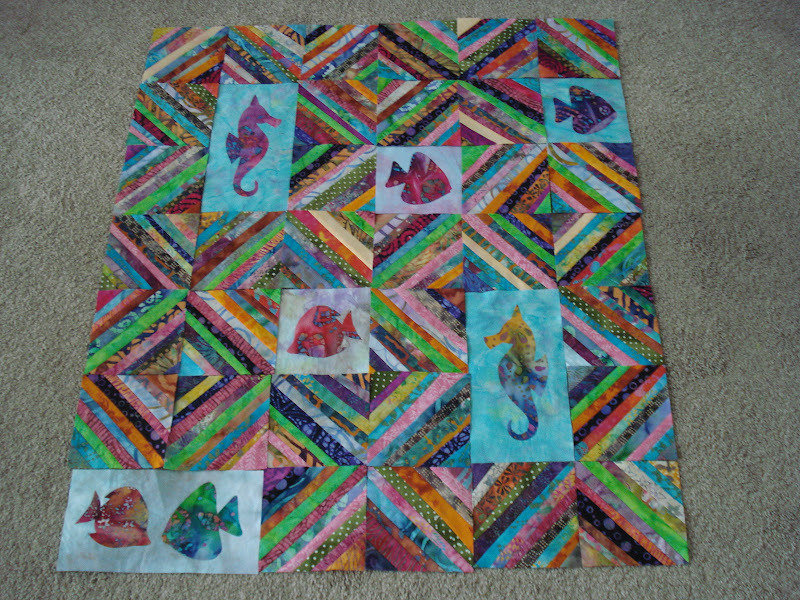 This will give the fish and seahorses a raised look (trapunto) when I come to quilt them. So these are my blocks all finished and ready to be sewn into the quilt. I will show you more progress soon I hope! I've also been quilting the butterfly quilt and I'm pleased with the progress I'm making. Shouldn't be long until that's finished. These all look awesome! 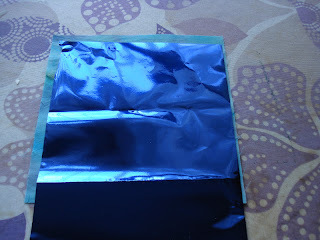 Will have to try some of that foil..I've never seen it here. You continually amaze me. This quilt is awesome. 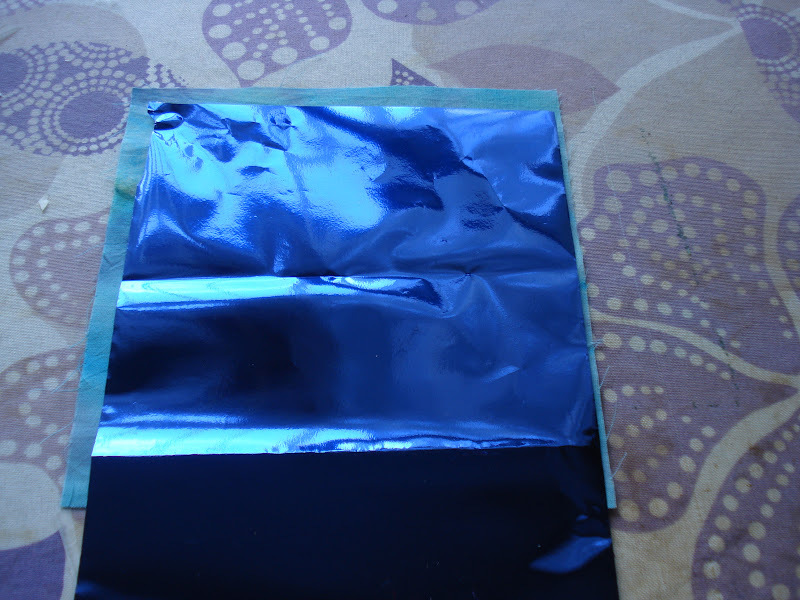 I love the look of that foil. I'll have to keep an eye out for some. Wow, i've never seen those before! I don't say anything most of the time because you leave me speechless!! I am just in awe of your work my friend! Just amazingly beautiful!! ohhhh...I love these little fishes and especially the sea horses!! How creative! 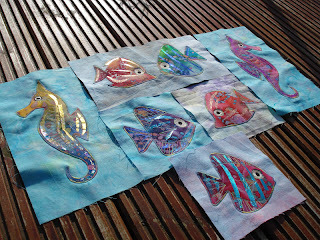 Your sea creatures are perfect with the batik fabrics and the foil gives it that little extra sumpin sumpin:) Can you wash it with the foil on the fabric? 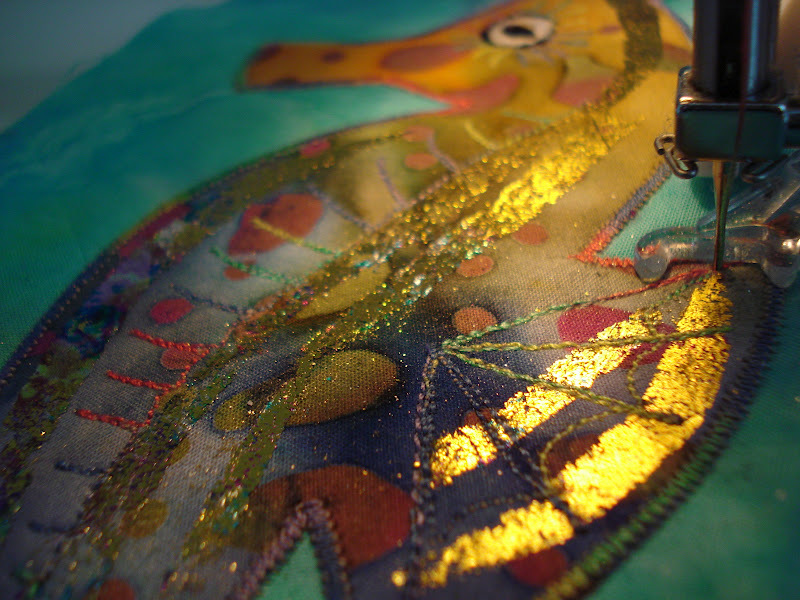 It's always fascinating how you take a beautiful project and make it astounding through your embellishments! 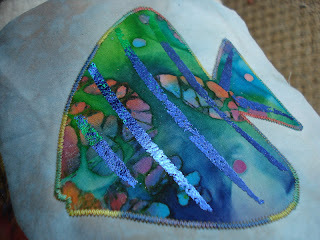 I love reading your blog to get ideas and inspiration. 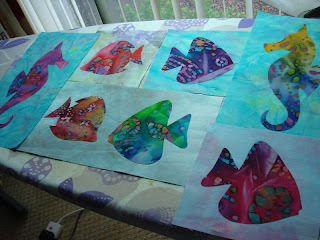 Those fish blocks were pretty cute even before all the lovely extras you added, great way to use up batik scraps. 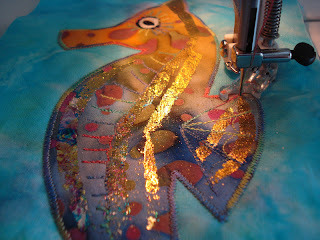 Really like how you used the foil - and the fish are so colorful - can't wait to see the finished quilt! Your fish are so cute and the foil adds so much Rhianon!! You are so clever Rhianon. I'll have to source some foil here later today. The effect is so good. 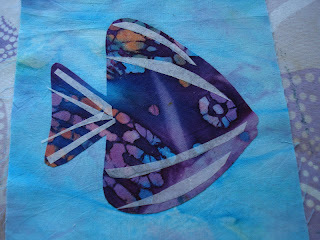 I also liked the finished product on QB - this technique would be perfect with my stripy quilt. 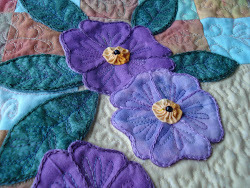 Visit Rhianon's profile on Pinterest. 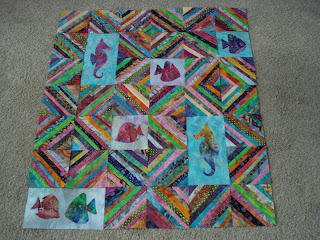 Breakfast at Tiffanys Lap Quilt - finished! Trish Got a New Car!